The first thing I noticed on this trip was the cost of the ticket. Having paid just £3 for a cheap day return from Truro to Falmouth Docks the previous day, I was expecting a similar (or even cheaper) price for a journey half the distance. Instead at the St Erth ticket office when I asked for a cheap day return, I was told the cost was £4 and given a "St Ives Bay Line Ranger" instead, giving me unlimited travel on the line all day long. But as I was going to St Ives and back just the once, I felt this was a bit of an imposition. Apparently if you are coming from Penzance or Hayle, the next stations either way, you can get a cheap day return, but any nearer to St Ives than that and you automatically get the Ranger ticket. Maybe this is a profitable way for First Great Western to capitalize on the large numbers of holidaymakers using this line in the summer? The second thing was that I was expecting the usual two car DMU to transport us to St Ives, but it was actually a four car double unit instead, which on the return journey was certainly needed. About twenty passengers were waiting at St Erth to get on the 15.11 train. 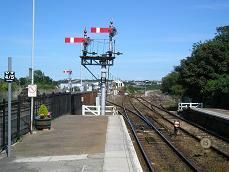 St Erth is the final station before Penzance on the Cornish mainline and the semaphore signals at the end of the platform give it a sense of timeless Great Western Railway, as do the original buildings, signal box and the white fencing between the mainline and the branch platforms. We set off on time and leave the mainline immediately, going under the main A30 trunk road before emerging at the western end of the Hayle estuary, which is now an RPSB nature reserve. It's mainly marsh here but there are plenty of birds to be seen including Herons, Curlews and Egrets. (The Devon and Cornwall Rail Partnership actually produce a leaflet giving details of what birds can be seen and where on this line). Our first and only stop of this journey is at Lelant Saltings station which has a park and ride scheme. Well over thirty people get on here and the train is now over half full. There are plenty of palm trees to be seen in the gardens of nearby houses. We have hardly moved away from the station before we reach Lelant village station, but we don't stop here. It's another single platform station with a bus stop. We can see the town of Hayle on the opposite side of the estuary and all of a sudden we see long golden sandy beaches stretching out before us and the Atlantic Ocean. The beach on this side of the estuary is known as Porth Kidney sands and its pretty deserted and unspoilt. Sand dunes start to obscure the view as we turn eastwards away from the beach and pass a golf course on our left as the train speeds up to about 40-mph. We pass into a cutting known as Carrack Gladden and then emerge with another beach below us to the right as we reach Carbis Bay station. Again we don't stop and the train then hugs the cliff side as we go right then left. We start to descend gradually and we start to see St Ives spread out before us. There's another large beach on our right which is very crowded and lots of cars between us and the beach as we finally pull into St Ives station. Again it's just a single platform and where once were other platforms, it's now a large and very full car park. After spending a few hours trudging the narrow streets of St Ives and spending time on one of its five beaches we make our way to the station. When we get there, there must be about 150 people all waiting for the train to come in. No wonder a four car train is used. Even then its standing room only for the unlucky ones. On the return journey the train stops at all the stations and by the time the park and ride crowd have got off at Lelant Saltings, the train is back to being just a quarter full.